Walking is a great form of low-impact aerobic exercise that can improve your endurance and cut your risks for serious chronic diseases. Whether you walk on a treadmill or around your neighborhood, the benefits are the same. A regular walking routine can also help you shed extra pounds and banish belly fat, but you’ll really need to challenge yourself to get those results. Consult your doctor before beginning any exercise regimen. Although walking can burn several hundred calories per hour, it’s still a less strenuous exercise than many other forms of aerobic activity, which means you’ll have to pump up the intensity to lose fat. According to Harvard Medical School, an hour of treadmill walking at 3.5 miles per hour burns about 300 calories for a 155-pound person. Upping the pace to 4 mph burns about 330 calories in the same period of time, and pushing it to 4.5 mph will burn a little over 370 calories. Keep in mind that you need to trim or burn a total of 3,500 calories to lose 1 pound. One way to increase your odds of losing belly fat with treadmill exercise is to use a set program on the machine. Interval workouts, which alternate periods of moderate activity with bursts of more intense activity, can give you the motivation to push yourself to the limit and incorporate a bit of jogging or very fast walking into your exercise. Using the incline function on the treadmill is another wise choice. If you spend 30 minutes walking up a “hill,” for example, you’ll burn more calories than if you walk on level ground. You’re not likely to see much of a decrease in your belly fat if you only work out on the treadmill occasionally. For weight loss, the American Council on Exercise recommends working out for at least 45 minutes at a time on five or six days per week. If you’re walking at a slow pace, you may need to put in even more time than that. When your schedule is tight and will only allow you short workouts, try to walk as quickly as possible, walk at an incline or jog for part of the time. You may think you have to do crunches and situps to get rid of belly fat, but aerobic activity is the best way to lose fat, since it burns more calories than core and strength exercises. Core exercises will help you tone your belly to give you a sleek midsection when your do lose the fat. 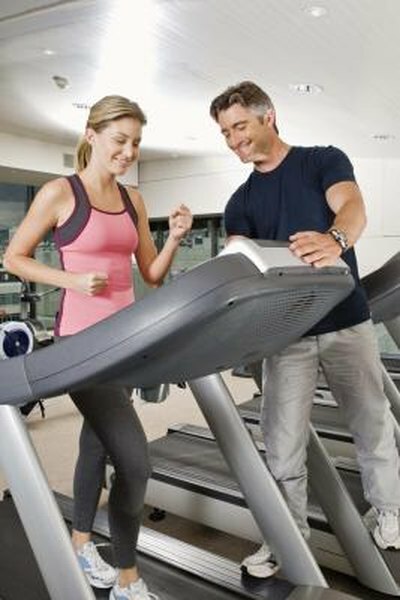 To accurately gauge the results of your treadmill workouts, weigh yourself and take your hip and waist measurements before starting the exercise program. Take the measurements again every two weeks; you should begin to notice changes in four to six weeks, particularly if you’re also reducing your daily calories. If you don’t see results, discuss potential alternatives with your doctor.